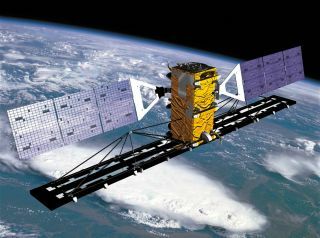 Canada's Radarsat-2, seen here in an artist's illustration, will end its operational lifetime in 2015 before country's replacemen – the delayed Radarsat satellite constellation flies. Canada's military defense capabilities are at risk due to a predicted two-year delay of a new fleet of Earth-watching radar satellites, critics say. But the country's defense department maintains it has a backup plan. The delayed Radarsat Constellation Mission (RCM) consists of three satellites meant to replace Radarsat-2, a five-year-old satellite that probes Canada's landmass, and that of other countries, with radar signals. Radarsat-2 is expected to last until 2015, and potentially longer. Industry Canada, a government department that oversees the Canadian Space Agency, recently revealed that RCM will launch in fiscal year 2016-17, two years later than planned. "The answer of the government is, 'We're still committed to the program' and all, but the actions don't follow the words," said Helene LeBlanc, who is a critic of the federal industry and a member of the opposition New Democratic Party. Similarly, LeBlanc said the impact of RCM's delay on Canadian jobs and defense capabilities is not being discussed. "Again, we're left in the dark." A spokesperson for Canada's defense department maintained that Canadian sovereignty does not hinge on the new Radarsat constellation. "The Canadian Forces rely on many resources to provide surveillance of the Arctic and maritime approaches to Canada," wrote spokesperson Daniel Blouin in an email to SPACE.com. "They [the Forces] routinely leverage classified satellite systems from our allies, employ ships, aircraft, land patrols and ground-based radars, to mention only a few of the resources used to monitor our territory and its approaches." Blouin's remarks contradict statements from documents published in Canadian newspaper The Ottawa Citizen in October. The article quoted defense officials concerned that Radarsat-2 could cease functioning before RCM is ready. One 2009 study quoted in the article indicated that Radarsat-2's defense capabilities are unique among Canadian satellites and can't be replaced with anything the Canadians have right now. “The capability will perish for all of GoC [Government of Canada] when Radarsat-2 ceases to operate," the report read. Senior defense officials repeatedly spoke about the importance of RCM in testimony before Canada's upper government house, the Senate. In an April committee meeting, Lt.-Gen. Walter Semianiw said RCM's satellites will provide "more real-time data and down-feed," particularly in the more sparsely patrolled north of Canada. "That is where we need to move," he said. "Satellites are clearly a critical enabler for us [in] achieving what we need to in the North, along with the other pieces: the UAVs [unmanned aerial vehicles], surveillance aircraft in the North and rangers on the ground. Those all fit together into a framework." The development of RCM is complicated because by its many functions, including defense, environmental monitoring and disaster management. The Canadian Space Agency oversees the program, but must meet the requirements of several other departments, including defense, during development. One Canadian space-advocacy group said the project would go faster if the government prioritized it. RCM delays will be a topic of interest at the annual conference of the Canadian Space Society this week in London, Ont. "Radarsat Constellation should be considered, for lack of a better term, a flagship mission," CSS president Kevin Shortt said in a SPACE.com interview, citing the Radarsat family's surveillance and environmental-monitoring capabilities as key reasons. "There should be a focus and a commitment on Radarsat, but it shouldn’t come at the expense of everything else. It shouldn’t be the sole project." After the Canadian Space Agency underwent budget cutsin the spring due to overall government cost cutting, contractors for Radarsat Constellation began cutbacks of their own. Prime contractor MacDonald, Dettwiler and Associates (best known for the Canadarm robotic arm) and a subcontractor, Com Dev, laid off dozens of employees. The contractor blamed the layoffs on a lack of commitment from the government concerning RCM. LeBlanc said she spent months hammering at the Conservatives with questions, mainly concerning the lost jobs. Her district is in Montreal, Quebec, which has a large aerospace industry and is near the Canadian Space Agency's headquarters. After what LeBlanc describes as government stonewalling, she made a written request. She asked questions about the government's plans for RCM, the expected launch date, how far along the project is and if it is over budget. The response from Industry Canada was tabled in Parliament as a sessional paper on Oct. 31. The department wrote that costs could not be disclosed due to ongoing contract negotiations. A two-year delay occurred because of "unexpected difficulties during the design phase," the paper noted, without elaboration. The paper maintained that the project is on track, with work finishing on the design phase. Negotiations for manufacturing are ongoing with MDA, Industry Canada added. MDA confirmed this in a November conference call with analysts concerning the company's financial results. When contacted by SPACE.com, Industry Canada and the Canadian Space Agency did not respond to questions seeking details about the delay. The defense department referred all questions on the matter to Industry Canada.